Cumbrian long jumper, Megan Busby had medal positions firmly in her sights when she recently represented her country for the first time. The 16 year old represented England for the first time in the home international event in Dublin last month. 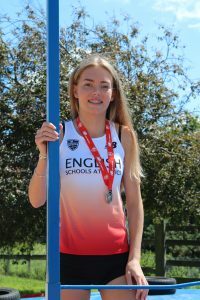 She also won gold in the long jump at the Scottish National Indoor Athletics Under-17s Championships in May with a new PB of 5.61m, which took Megan to the top of the UK rankings. Megan, from Carlisle, competes for Carlisle Aspatria Athletics Club and Giffnock North Amateur Athletic Club and trains several times a week, although her routine has been interrupted during her GCSE studies, and with the closure of the Cumbrian training facilities following flood damage. Megan has received £1,250 from the Cumberland Educational Foundation and the Edmond Castle Educational Trust towards kit, equipment, travel and coaching costs to help her on her way to becoming an international sports star. Reflecting on her daughter’s recent achievements, Megan’s mum, Angela, said: “Megan has made such a massive improvement this year in her chosen sport that she was nominated as Sports personality at her school. This has also encouraged two of Megan’s friends becoming more involved with the sport.